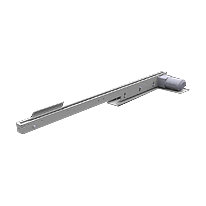 Model 1670 Exit Conveyor for Centerless Grinder is specifically designed to mount to the grinder’s lower slide and exit parts to the front of the grinder for end feed applications. These conveyors are capable of feeding all kinds of different parts. Accept steel sleeves from customer’s manually loaded totes at random onto a bi-directional conveyor. Tubes will merge from the in-feed (load) lane onto the orienting lane conveyor and discharged in a continuous, end-to-end stream to the workrest of a centerless grinder.